It seems like every car person in the world has at least a passing interest in the mechanical and stylistic choices that watches can bring. Unfortunately, as I tend to spend my money on project cars and a parts habit to support them, I don’t have the thousands of dollars required to get one you might find on the wrist of a Le Mans winner, or James Bond. For many people, wearing a wrist watch is something of a labor of love. They no longer serve a real purpose, as we have phones on hand at all times to tell us the hour with space-satellite accuracy. In today’s world, a watch is a device of expression. You can literally wear your style on your sleeve. I, like a lot of my car-addicted friends, would prefer to have eight or nine bargain basement fun cars than one supercar. The same holds true for watches. Sure, you don’t get the mechanical complexity and precision you might find in a high end automatic-movement chronograph, but you could fit ten different styles into your rotation for less than the cost of one Rolex. 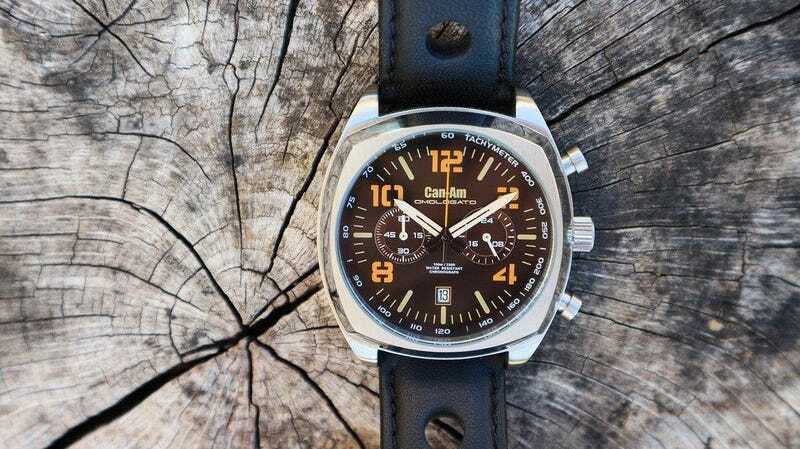 After reading countless watch guides for folks with four and five figure budgets, I knew the time was ripe to assemble a list of stylish and adventurous watches that car folks might enjoy. Some are classic and understated, some are wild enough to get you noticed. That RELOX you bought on vacation to Thailand isn’t fooling anyone, so grab one of these cool pieces to get your time game back up to speed. As always, a nice selection of replaceable bands in metal, leather, and nylon NATO-style is important. Grab yourself a set of tools so you can swap those bands and replace batteries yourself. Yes, this watch was designed by that Giugiaro. It was also worn by Sigourney Weaver’s character Ripley in the 1979 film Alien, so it has that going for it. The original release of this watch is still selling somewhere around $800, but the more recent re-release of the watch can be had for far less. Check eBay occasionally for deals. Travel the world with a nice rugged watch. Timex still does take a licking, and this one looks pretty great, too. If you’re into overlanding, off roading, or adventure bike riding, this could be a great watch to fit your style. I like the subtle world-map in the design of the face. Features 24 time zones, is water resistant, and has the Timex traditional “Indiglo” light up feature. Versatile and casual. Check it out on Timex.com. 80s nerds will remember the original calculator watch. These were cool then, they dipped into ridiculousness, and have rebounded back to retro cool. You’ll fit right in at Radwood, and how convenient is it to be able to calculate MPGs at each pit stop? It’s cheap and lightweight, but it’ll run basically forever. Under seventy dollars from Amazon.com. I’ve been a Nixon fan since the early 2000s, as they’ve been building stylish but inexpensive and quality timepieces for all that time. They were also featured heavily in action sports magazines that I loved back then, and advertising does work. In any case, as their target market has aged, they’ve started providing more adult designs, like this one. The Sentry Chrono is part of their “Speedster” collection of watches. Check out the Sentry Chrono on Nixon.com. With a classic two-dial chronograph design, this watch has a slim and good looking face. The black and gold, with a dash of green, will look good on the wrist, and a perforated suede band is sporty and stylish at the same time. This is a versatile design that could go with you from the office to the race track. With a classic tartan design that would look at home as the fabric inserts of a vintage seat, this is a playfully designed watch from Paola Navone’s second collaboration with Swatch. The Swatch watch is a quality piece for a great price, and tons of minimalist style. This and tons more great designs on Swatch.com. I have never seen a dial movement like this, and it’s very mechanically cool. With three independent rotating disks that bring the time number into a field of vision, this watch has a very automotive feel to it. Like a classic dash gauge, this watch gives you all the information you need at a glance. With a rose gold case and a black face/band combo, this is a formal-ish conversation piece that would be perfect for your next car club holiday party. With a square case and twin dial design reminiscent of Heuer’s old-school Camaro watch, but with bold even numerals around the dial, the Omologato Can Am brings your wrist back to the 1970s. It’s a neat low-volume watch for a fair price. For a watch designed in the UK, this one really gets a very North-American racing series feel correct. Limited to 200 pieces, get yours at OmologatoWatches.com. My Shinola is one of my favorite watches in my collection. It’s a simple look with a great bold face. Assembled in Detroit of Swiss and Asian parts, the Runwell is a back-to-basics watch with some heft to it. It looks like a solid handshake feels. You can trust it, like your dad. It’s more than double some other watches on this list, but it’s a nice piece available in dozens of color combinations. You can usually find a second-hand example on ebay for less. This particular colorway is meant to invoke the University of Michigan Wolverines, but I would tell people it was actually the Sunoco colors of Penske racing’s Daytona 24 effort Ferrari 512m. Right? Check it out on Shinola.com. While Fossil has traditionally been the first watch buy for college-aged dude bros, some of their designs are quite good. While I have no need or desire for a smart watch, some of you may, and this one seems to be a good choice. For one thing, the face is configurable to a number of classic looks, but for another, it’s the largest touchscreen face smart watch in the field, and the price is nice. It’s got Google Maps turn-by-turn right on the watch face, which is nice for driving. You can keep your phone in the center console or glove box where it belongs! With a face and bezel design that looks far more expensive than it is, this Seiko chronograph will get the same kinds of looks you might with a high-end automatic. It’s a busy dial, but once you learn it, it’s quite functional. All-gold is making a throwback comeback, and you should probably have one in your wristwatch quiver. This bad boy has been one of the inexpensive style icons of recent watch history. The first run sold out quickly, and remains relatively limited production for a Timex piece. Here is what Timex has to say about it: “This edgy timepiece – the latest in an ongoing collaboration between the celebrated menswear designer and the iconic American watch brand – is an homage to the stylish drivers of Formula One in the 1960s and 70s. Nodding to speed dials and roulette wheels, the Blackjack evokes the noir glamour of fast cars, hot tires and midcentury Monaco casinos – all in a sleek New York style.” Sounds like a winner to me. With a ton of bold colors and a very hearty watch body, the G-shock can never really be the wrong choice. Everyone needs a nicely assembled digital band in their watch box. This watch is really only on this list because I wore it to the Pebble Beach Concours weekend a couple years ago, and Dario Franchitti asked me if he could look at it. When I removed the rubber band and handed it to him, he commented that it was very stylish. I didn’t tell him that I bought mine on closeout for $24. Tons of style in an occasionally inexpensive package, and available with an analog or digital face. I vastly prefer the analog. It’s out of production now, but you can get one on eBay.